I graduated from Long Beach Poly High School in June 1962. I worked at several jobs before settling in at Douglas Aircraft Company as an interior installer and leadman. 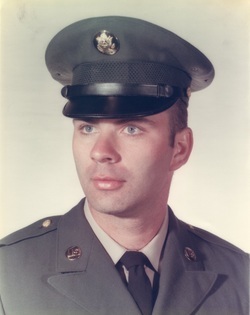 I was drafted in November 1967, and sent to basic training in Fort Ord, California. From there, I went to Fort Lewis, Washington for Advanced Infantry Training, and after that I was sent to Fort Benning, Georgia for Jump School. After completing my training, I got to go home to California for a 30 day leave before shipping out to Vietnam. In Vietnam, I was assigned to the 173rd Airborne Brigade. I did a one year tour of duty in Bong Son. I was very happy to return home to California at the end of my tour of duty. I returned to my job at Douglas and remained there until I retired on February 29, 2000. I bought my home with my wife Jeanne in Lakewood in 1983, where we raised our two daughters, Elizabeth and Deborah. I moved to Lakewood in 1983, and I still live across the street from Lakewood High School.